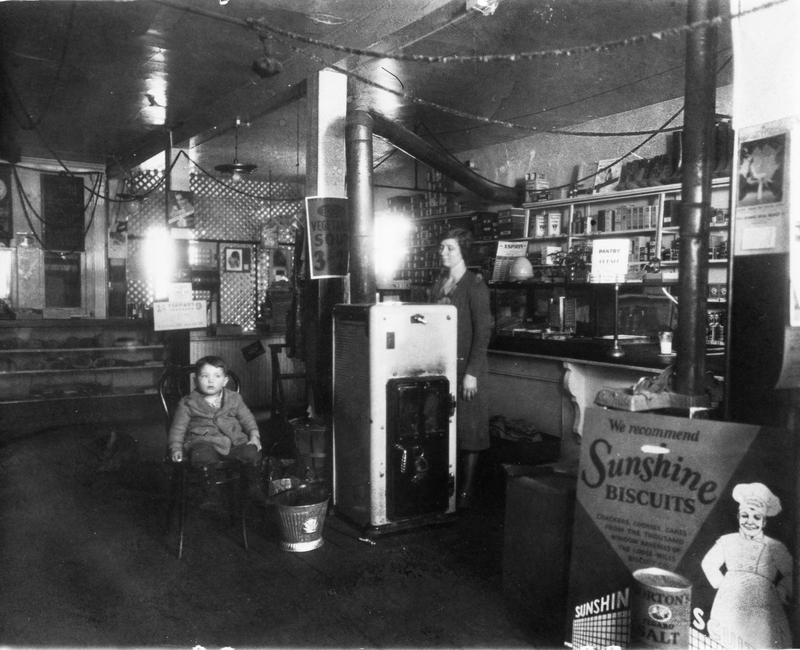 Located on the South Side of the Square, later became a Filling Station. . . .
Harold "Cobb" Farris is seated in his father's grocery in December 1931. His mother was pregnant with his sister, Barbara, who was born in January 1932. Christmas decorations are up which didn't happen until December. Cobb, who got his nickname when a classmate declared him "tough as a cobb" was born in Columbus in the late 1920's. His father worked for Timken. During the depression, his father was laid off so the family moved to Galena where an aunt ran a tavern in the early 20's during prohibition. In the mid 1930's Mr. Farris was called back to work at Timken and the family moved back to Columbus. In 1941 Timken let his father go and the family made a final move to Galena.